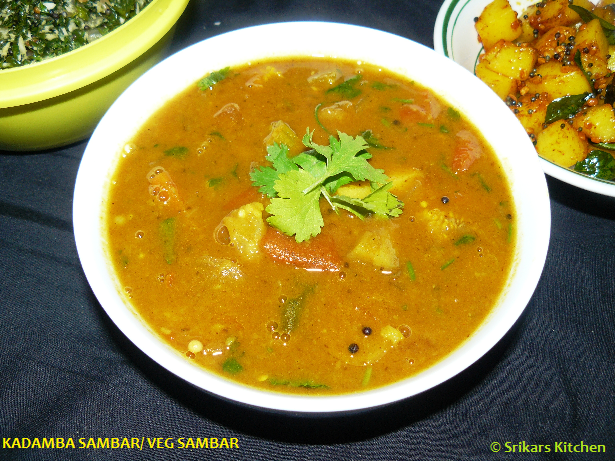 KATHAMBA SAMBAR- This sambar is made with lots of vegetables.I used only a few vegetables, but we can make with any kind of vegetables.The taste is also really good & delicious. Heat oil in a pan, mustard seed, fenugreek seed, channa dal & allow to temper. Add chopped onion, green chillies & sauté few seconds. Add all vegetables, salt & mix well. Cover the lid & simmer for 3-4 mins. Soak the tamarind in warm water & squeeze the juice from it to make around 4 cups. Add tamarind juice, sambar power, hing & allow to boil. Check the seasoning & allow to boil until all veggies are cook well. Add cooked tuvar dal &mix well. Garnish with curry leaves & coriander leaves & mix well. love this step by step pictures. There's no way we can give up sambar especially for my other half. I like the combo of the veggies. While I have made sambar numerous times yet I am gonna try your fabulous version soon. Sambar is always my comfort food. love to have with lot of veges, as u have done it. Sambhar is my fav. But my hubby don't accepts it...urs version tempting me much more vl try whe I visit India ..